In the ten years since the planes struck the World Trade Center, we've learned a great deal about how much we took for granted. In one brief moment, our worldview was altered and assumptions were destroyed. In the days that followed, we grieved for those lost and the families who were trying to cope in the wake of the tragedy. What have we learned during those ten years? What lessons were we able to take from that day and apply to our own lives, regardless of whether we lived in New York, Pennsylvania, or even across the country. Everyone felt some degree of loss on that tragic day, regardless of their geographic proximity. Tragedy could strike any day. While it might not be in the form of planes crashing into buildings, it could be a person who was drinking and made the choice to get behind the wheel. It could be an earthquake that sends buildings crashing to the ground. It could be a chance blood clot, wreaking havoc in the lung or brain. The reality is, we are all mortal. You just never know. How many people walked out of their homes that morning and headed to work without a second thought? How many people wish they had taken the two seconds to tell that person who is gone forever "I love you"? Don't live with this regret. Never miss the opportunity to tell someone how much they mean to you. Shower them with hugs and kisses every chance you get. In addition to telling the people you love how important they are, make a point of showing them. Hugs and kisses are great, but take it a step further. Do the chores you know they hate doing. Make plans to do activities they want to do. Talk to them about their day -- and really listen. It can be hard to let go when someone has hurt you. But holding onto a grudge hurts you much more than it hurts them. Let go. It's okay to learn from the experience, but remember that we all make mistakes and bad choices. If you've let those choices stand between you and a family member or a long-lost friend, take this opportunity to call or write and talk it out. 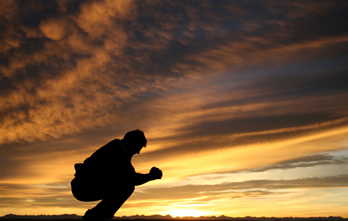 Give them your forgiveness or, if you were the one who messed up, ask for theirs. You may not always get it, but you will know that you tried. Adding these lessons to your life will improve your relationships with everyone you know. You will rest easier knowing that bygones are bygones and the people who are important to you know that, without question, you love them very much. If you are a terminally ill patient, spirituality may offer you relief and positive emotional strength as you cope with life and death challenges. A useful resource for information on the impact of spirituality for people facing end-of-life issues is the American Cancer Society at http://www.cancer.org/Treatment/TreatmentsandSideEffects/ComplementaryandAlternativeMedicine/MindBodyandSpirit/spirituality-and-prayer. One of my absolute favorites. Nothing completes a good S'more like a Hershey bar, which happens to contain an antioxidant compound called procyanidin. Although research is still in its infancy stage, scientists have observed these molecules slow the development of breast cancer in lab cell cultures and prostate cancer in rats. It has been suggested that the most efficient way to introduce procyanidin into the bloodstream is to consume chocolate drinks. So go ahead! 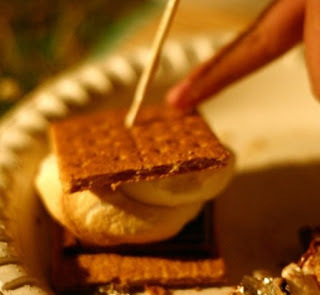 While you're at it, save those chocolate bars for the next morning and blend away for a nice S'more Smoothie. Red wine contains high levels of resveratrol, a plant chemical which has been shown to reduce tumours in lab tests. Depending on the type of grape used to make the wine, some wines may contain more cancer-fighting antioxidants than others. For example, wines grown in Southern France are high in procyanidin, that neat little compound found in dark chocolate. As if that weren't enough, add oranges, cherries, apples, or another fruit to your sangria recipe to boost the health benefits! Well, although that wasn't as therapeutic as I thought it would be, I think I'm at least in the right frame of mind to get back on track this week. Grilled eggplant with tomato sauce and salad on the menu tonight! 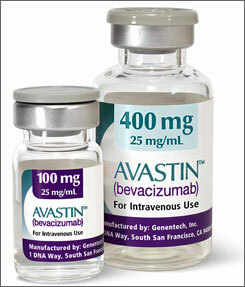 The US Food and Drug Administration has taken a hard look at Avastin, a drug used in cancer treatment. It is used in therapy for several forms of the disease, but on June 29, 2011, an advisory committee for the FDA voted unanimously to rescind the drug's approval in breast cancer treatment, stating the risks outweigh the advantages. Don McLeod, a Medicare spokesperson, stated that they will continue to pay for the drug if it is revoked: “The label change will not affect our coverage." Avastin is marketed by the Switzerland-based Roche--the world's largest biotech company. According to Roche, "Avastin is approved in the US and Europe for the treatment of advanced stages of colorectal cancer, breast cancer, non-small cell lung cancer and kidney cancer, and Avastin is also available in the US and over 32 other countries for the treatment of patients with glioblastoma (a type of brain cancer). Avastin is the only anti-angiogenic therapy available for the treatment of these numerous advanced cancer types, which collectively cause over 2.5 million deaths each year." An article by Reuters states "Some 17,000 U.S. patients take Avastin, which costs about $8,000 a month. Using Avastin for metastatic breast cancer costs about $88,000 a year, based on people taking it for approximately 11.3 months." The high cost may not be as much of an issue if the evidence of its effectiveness were more concrete. Avastin belongs to a family of drugs called "monoclonal antibodies", which are designed to inhibit the growth of tumors by blocking the production of new blood vessels--basically "starving" the cancer. It is not considered chemotherapy medication, as it does not directly attack cancer cells, though it is only approved for use in combination with chemotherapy. Safety information from the Avastin website states, "The most common side effects of Avastin that occurred at >10% and at least twice the control rate include nosebleeds, headache, high blood pressure, inflammation of the nose, too much protein in the urine, taste change, dry skin, rectal bleeding, tear production disorder, back pain, and inflammation of the skin." Gastrointestinal Perforation: The development of a hole in the intestines or stomach. Slow/Incomplete Wound Healing: Since the drug inhibits the growth of veins, surgical wounds heal slowly. Various Serious Bleeding Issues: Stomach, coughing up blood, bleeding in the brain, and vaginal bleeding. Stroke/Heart Issues: Includes heart attack, blood clots, mini-stroke, and chest pain. Kidney Issues: Avastin increases protein in urine which can lead to serious or fatal kidney problems. Vision and Nervous System Issues: Includes sluggishness, seizure, blindness, tremors, and confusion. In light of the low success rate for current medical treatments of cancer, much research in alternative medicine therapies has begun in recent years. The motivation for study in these alternative therapies is to find an effective combination of clinical and psychological treatments of cancer. Such combinations of alternative medicine with current medical treatments may lead to a better prognosis for mesothelioma and cancer overall. One particularly promising alternative medicine therapy is the Emotional Freedom Technique, abbreviated EFT. Developed by Gary Craig two decades ago, EFT is a psychotherapeutic method of relieving the psychological and emotional consequences of disease, such as fear and anxiety. In essence, EFT is a non-invasive manner of triggering and desensitizing acupressure points located all over the body, causing a holistic betterment of the psyche and emotional condition. Proponents of EFT emphasize the benefits of its “energy psychology” approach in aiding cancer recovery. 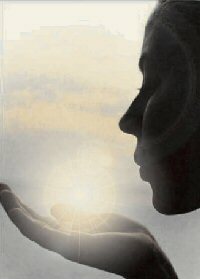 Reiki is one of many alternative healing practices being used to reduce stress and promote healing. Derived from the Japanese words for “Higher Power” and “life force energy”, the ancient healing art is performed by trained practitioners who place their hands near or lightly on the body to channel energy. It may also be administered to oneself with little training. Used both to maintain good health and to create conditions for the body to repair itself, Reiki has recently been endorsed by Dr Mehmet Oz, one of the nation’s leading cardiologists and talk show hosts. As its benefits become increasingly more well-known, the practice is also gaining favor as an adjunct to traditional medical treatments. It is now being used in many hospitals to decrease the discomfort of treatments for cancer and to relieve symptoms of chronic diseases. Because Reiki is “transferred” by a master teacher to a student in a process called an “attunement”, it is easily learned and practiced - thus allowing the recipient to tap into an unlimited source of universal energy for healing both oneself and others. The energy that supports life flows throughout the body and nourishes its organs and tissues. When negative thoughts or trauma disrupt its natural flow, energy is blocked or weakened. It is important to realize that Reiki does not heal illnesses; it helps to repair the energy field so that the body can resume its normal processes. Although spiritual, the practice is not a part of any religion and requires no personal beliefs or dogma. Reiki does, however, promote a harmonious, ethical, and peaceful lifestyle that is compatible with the teachings of all cultures. Because Reiki’s energy comes from God, it may have positive spiritual and emotional components, as well as physical ones. While all energy healers channel energy, Reiki is different from other styles because it can only be accessed by being passed from a Reiki Master to a student. Energy healers who use other methods may also be attuned to Reiki, and many report an increase in energetic ability as a result. The use of symbols is one of the ways Reiki energy is channeled, and some masters stress the importance of intention. Regardless, the energy is said to have an intelligence of its own that directs it to the area of the body where it is needed. The American Cancer Society has endorsed Reiki as a form or complementary medicine for mesothelioma and other kinds of debilitating malignancies, and many hospitals now hire Reiki practitioners. Although more studies are needed to prove the benefits of Reiki in cancer care, it appears to help patients feel better without creating side effects.